What are the Steps to a Career Change into the Pharma Industry? What are the Steps to a Career Change into the Pharmaceutical Industry? This page is for you if you’re thinking about a civilian career in pharmaceutical or medical device manufacturing. All too often, the pathway to civilian careers seem… muddy. You’re not sure how long it’ll take, what you’re committing to and how much it will cost. So we’ve tried to set this out as clearly as we possibly can. If anything’s still unclear by the end, jump straight on over to contact us and ask! How Long Does A Career Change Take? The short answer is that you could be ready to start applying for a job within 4 months of starting the program (although actually receiving your academically accredited certificate will take a minimum of 12 months of study). We’ll get into the details of that timeline further on but we think it’s important to set this out so as you have clear expectations of the overall process. So what would your retraining actually look like? Here at GetReskilled, we run several courses. Each is designed to build on your previous knowledge and experience, providing the relevant training to “fill in the gaps” and make our graduates suitable for the pharmaceutical or medical device manufacturing industries. As someone coming from a military background, you should be considering our Certificate in eBioPharma Validation programme. We’d first suggest you read the linked page which will give you all the details you need about it, as well as reading the rest of this page, to get a true sense of the timeline. Once you’ve decided that this is the career for you, hit the apply now button on that page. Don’t worry if you’re not 100% sure and still have a few questions – you’re not formally enrolling in the course just yet and will have the chance to ask them before committing. We will consider your application and the person who would also be your course advisor while taking the course will give you a call to discuss whether or not you are suitable. You cannot be accepted onto our course without a phone call with your potential course advisor. On the basis of this information, you will receive confirmation of which course is right (Or Not) for you. Please keep in mind that you are talking to the person who will be your course advisor – this is not a member of a sales team. You should take this opportunity to ask any questions you might have about the industry, the course or your career options. You will need to take our Manufacturing Safe Medicines (Foundation Course) which is free of charge. 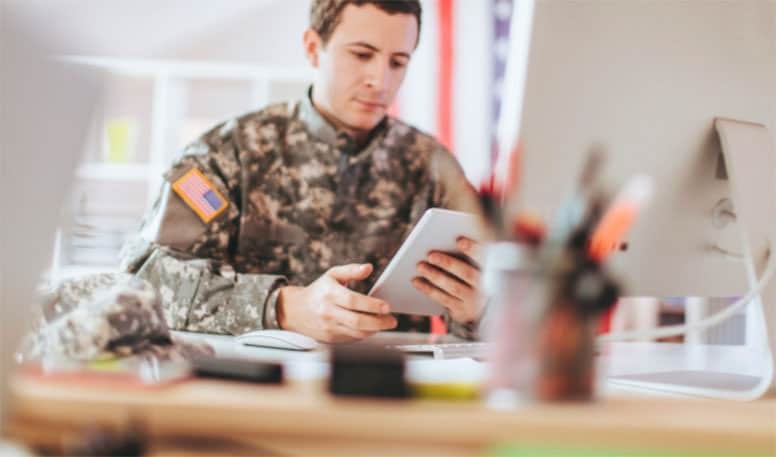 We ask all military personnel, veterans, their spouses or children applying for our Veterans Scholarship to complete this free course as it allows you to be completely confident that this is the right career for you before you invest any money in reskilling. Based upon this course, you can make a decision to proceed with the rest of the program or drop out at ZERO financial risk. It is a 4-week, part-time course delivered completely online. As with all our courses, it consists of a series of lecture videos, lecture notes, and self-assessment questions. This course will provide you with essential basic industry knowledge such as Industry Regulations & Guidelines, Process Validation and Documentation, Key Manufacturing Technologies and Supporting Technologies. Upon completion of a final written assignment, you will be awarded a GetReskilled Certificate. You will need to submit any other necessary documentation and payment forms to complete your registration for the Certificate in eBioPharma Validation program. As we previously outlined, you’ll now have enrolled in our Certificate in eBioPharma Validation course. So what does studying that actually look like? This course is delivered online – there are no in-person classes. The programme consists of 6 modules, delivered over 12 months. It is a part-time course that will take you approximately 14-16 hours per week. This course is delivered by industry experts and is academically accredited by the Dublin Institute of Technology, the largest university in Ireland. You get the structure of a taught programme and weekly check-ins with your course advisor alongside the flexibility of online learning – learn at a time and place that suits you. The 6-module course will cover the essential, knowledge, concepts and process that are used to manufacturing safe medicines so you can start a new high paying career in this sector. For a full breakdown of content, download the brochure here. What is the Certificate in eBioPharma Validation Module Content? Module 6 – From URS (User Requirement Specifications) to PQ (Performance Qualification). Click here for the full syllabus. Each module lasts 8 weeks and has its own assignments. The course is delivered entirely online. Dr. Joe Brady and Dr. Anne Greene, both of the Dublin Institute of Technology deliver the modules online using our online classroom system called Moodle. Don’t worry if you haven’t used Moodle before, it’s super easy plus we’ll give you full instructions on how to use it. What is a typical week? Each module has 8 “sessions” of online content, one per week. Each session of online content typically includes 8-12 topics. A set of course notes – these provide additional depth to the video content. Two sets of self-assessment questions – one before the new content to warm up any prior knowledge; and one after the new content has been delivered, to help you assess how well you’ve internalized this new material.The purpose of these is to have you to consider what you have learned and identified any gaps in your knowledge. If you cannot answer these questions, you should revisit that topic’s learning materials. These questions are not marked by course advisors but you should really view them as sample interview questions, as these are the sort of questions you’ll need to able to confidently answer to get a job in the industry. It is extremely important that you take the time to consider them and write high-quality responses. A visit to the class discussion forum – after each topic you should spend some time on the class discussion forum where you can chat to other students about the topic, about any difficulties you had or to explore ideas further. In total, you should plan for approximately 14 -16 hours of study time per week. You’ll have 24/7 access to the online materials. We recommend creating a timetable that fits your studies into a schedule with any other commitments you have. Each module concludes with an end of module assignment. More than just proving that you’ve understood the material, our assignments provide a real-world benefit too. In completing them, you are compiling a portfolio of projects that you can take to interview and discuss with employers. You will have documented proof of your ongoing achievements, helping to give you a competitive edge during the interview process. Your course advisor will check your activity logs every week to ensure that you are keeping up to date with your studies. If he or she sees that you’re not, you’ll get an email or phone call to discuss how you can get back on track. This gives you an additional safety net and means that any possible issues are caught early on when it’s easiest to resolve them. Your course advisor is also your point of main contact. You’ll be in regular contact with him or her throughout the course and will get to know each other very well. This personal touch during an online program is really valued by our students. You can access the online classroom 24/7, meaning you can create a study schedule that works around your current commitments. We also know that your work schedules are unpredictable so we offer flexible delivery. You’ll be able to slow down, speed up or pause the delivery of the course. Once you start the Certificate in eBiopharma Validation, you will automatically be enrolled in our 25-week career coaching program. This is an additional module of your course that walks you step by step through the job hunting process and gives you all the help and support you need to successfully find a job in this industry. What surprises many of our trainees is that you can (and should!) start applying for jobs while your course is ongoing. You will have enough knowledge to realistically start talking to employers from about 4-months into the eBioPharma Validation course. Our job hunting module will guide you through starting this at the appropriate time. It is not uncommon for our trainees to find a job while still studying. And since the Certificate in eBioPharma Validation is a part-time course delivered completely online, you can continue your studies while you work. This is crucial because it will still be extremely important to employers that you complete your course and get your academically accredited certificate. But often, just knowing that you are studying a relevant course and will have a relevant qualification in the near future can be enough for employers to let you get started. Even if you don’t manage to secure a job while you study, you will have access to the online learning materials for at least 6 months after you have finished the course. This will help you refresh and prepare for interviews. In addition, the Job Hunt Resource Centre on our website is entirely open-access. You can read articles and find resources to help with your job hunt while you study and for as long as you need afterward. What is the Job Offer Guarantee Program? If you live within 50 miles of the Philadelphia to New Jersey pharmaceutical manufacturing corridor (or are willing to relocate here for a job), you will have the option to enroll in our Job Offer Guarantee program at no extra financial cost. If you follow this module and complete all the associated tasks, we’ll guarantee that you get a job offer within 3 months of graduation or you get your course fees back. For people in these areas, this means that you can take our Certificate in eBioPharma Validation at zero financial risk. You’ll either get a job in pharma or you’ll get your course fees back. If you don’t live within those pre-defined areas (or aren’t willing to relocate to one to work), you’ll still have access to the module and the support of a career coach. You just won’t have the job offer guarantee. Are there further opportunities for study after eBioPharma Validation? As well as being a stand-alone Certificate Program for securing employment, it is also a stepping stone to our BSc degree in the Manufacture of Medicinal Products. For more information on that, check out this page.